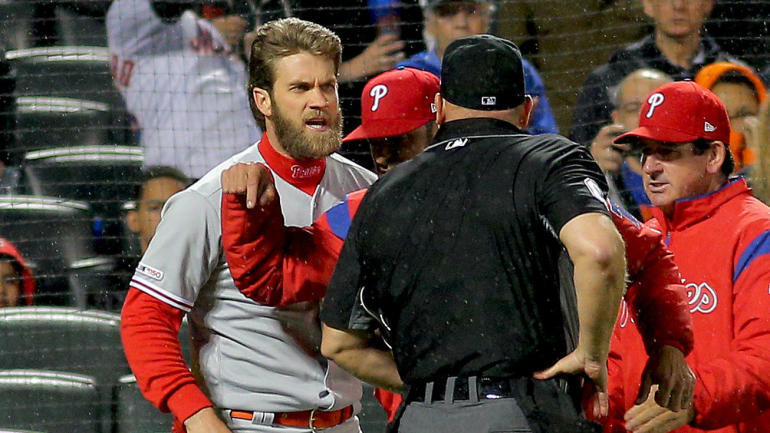 The Philadelphia Phillies reportedly have big plans this winter. Jon Heyman of FanCred reported some rival executives believe the Phillies could sign both Manny Machado and Bryce Harper in free agency. Machado and Harper are expected to land contracts that could put them among the highest-paid players in MLB history. Machado, 26, has hit .302/.374/.545 with 34 home runs and 93 runs batted in this season with the Baltimore Orioles and Los Angeles Dodgers. He is seventh in baseball with 5.8 wins above replacement, per FanGraphs. He's been a five-win player three of the last four seasons. Harper, 25, has not had quite as much success in his walk year. He's hitting .247/.388/.503 with 33 home runs and 94 runs batted in. He's posted 3.1 wins above replacement and has been a glaring negative defensively, per FanGraphs. A strong August upped his averages across the board, but it seems unlikely Harper will get the $400 million contract some had speculated about. Nevertheless, Machado and Harper are in a unique position because of their performance levels and age. Most players, even good ones, reach free agency around their 30s. Harper and Machado can demand 12-year contracts that wouldn't even theoretically push them past their prime. They aren't going to be paying $30 million to a 41-year-old Albert Pujols the way the Angels will in 2021. That means the bidding is going to be astronomical and will take a true all-in commitment from Phillies ownership to make it happen. Harper and Machado combined is a $600 million endeavor—possibly even more.